Hi! Im having my jaw surgery july 25 and i have to start school two weeks later is there any advice on how to deal with everything while having to go to school? I’m currently in graduate school and I took five weeks off for my surgery. It would all depend on what class you’re taking. Is it online? Or in a classroom? It would be hard to take exams while on pain medication and possible anti nausea meds and you certainly can’t drive under the influence. I ended up taking pain meds for about two weeks but everyone is different. I would talk to your instructor also maybe they can work around it. hey sydney ! all i can say is that you’ll be really swollen , that’s how i was. pain was fine, i stopped my pain meds the second day post surgery my only issue was the swelling & congestion. I was still pretty swollen two weeks later. but i was doing everything the same, as in lifestyle wise and i was talking. i had surgery during winter break so i could have a month to rest just in case. Hi to whoever can answer this question. Does anyone know the cost with insurance to have hardware in jaws removed? or even without insurance? Apparently its not a major surgery and could be done at an office visit I heard. I had my surgery back in 2016 august. hospital! I had mine done July 2, 2018. Today is July 24.
not have gone home right after the surgery! You’ll be sent home with meds for pain, anti nausea meds. Is very good but it’s giving me nausea and headache. I see the Gastroalogy Doctor this Thursday and will find out more. Hi Teresa! How swollen were you after the plate removal surgery? Was it like the jaw surgery? I couldn’t move my lips properly after jaw surgery for about a month so Im scared it will be like that after the pin removal. Would 2 weeks be OK to go back to work? You will be ok it just like pulling a wisdom tooth out you will be ok to go back to work in two weeks I feel alot better after they removed the plates and screws. I feel the same way! I am getting my double jaw surgery summer of 2019 and want to be able to enjoy my summer and enjoy my senior year of high school without worrying about swelling and uncomfortability. I had double jaw surgery, sliding genioplasty and wisdom teeth removed in my surgery and it took over 8 hours. I was only able to get in the Wednesday before school started (the following tuesday) which gave me less than a week to recover before school. The biggest issue was congestion. I had decent energy and could function independently within 4 days and went back to college the Monday before it started and everything went fine. So as long as you aren’t being too strenuous N such or putting yourself at risk of getting your jaw knocked out of position you should be able to live pretty normally (besides diet) after a week. I am 19 so that helped, but sounds like you are 18ish so you have youthfullness on your side as well! I could talk decently a few days post op it just took a lot of effort. Try walking several miles a day as soon as you are able (I started taking walks 2 days post op) and it helped get my body back into the swing of things and drain lymph from my face. So if you rest properly, eat well and get active asap you can function normally in a week or so! I’m having lower jaw surgery on June 20th. 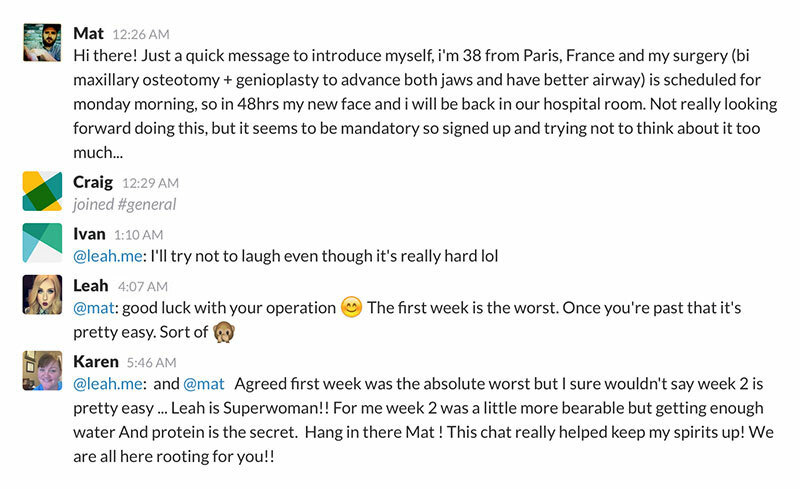 I am kind of worried about returning to work two weeks post op. I am a registered nurse working in a hospital 12 hour shifts. Of course. I won’t be able to take pain medications or rest during my shifts. I will be responsible for 4 or 5 patient and will be responsible for my patients and not myself. Just wondering about everyone’s opinion about returning to work that early or should I wait a week or two more? Nursing is a demanding job. I’d try to take at least another week of if possible. I have a desk job and returned part-time after 10 days and it was still rough going. I took a nap each afternoon and iced regularly. I never needed anything more than ibuprofen but the body really needs the time to heal. I was just exhausted and uncomfortable mostly. Best wishes for a speedy recovery. Thanks for the reply. That’s what I was thinking too. Thinking about having to take care of patients during that time makes me anxious. Ideally I would recommend at least a month because of your job but I know its hard to take that kind of time off. Be extra good to yourself. Take extra vitamin c, protein and anti-inflammatories like tumeric and bromelain. I am a physician who had bijaw surgery. I recommend you to leave at least a month or until your splint taken off. Because if you have splint in your mouth, it may lead to incorrect verbal communication which means more human error. That’s a great point doctor! I think that’s what I’m going to do. Hi! I had jaw surgery (double-lower jaw advancement and disjunction). I am a teacher and had it done during a two week holiday but ended up taking an extra month off too. I am actually going for my first day back tomorrow and just about feel ready to have to speak all day. Recovery is going well but I can’t nlw understand how anyone could go back to work after two weeks like my surgeon suggested… I hate to be negative but I definitely needed more time than that particularly in the job that I’m in. i was wondering why i had a big bump on my left bottom side all i wanted was to get well and that bump wouldn’t go away thank god i found out why that bump was. So they removed both the plates and screws from both sides only the bottom. im also on my 6 month post and i have had another bottom jaw surgery the screws on my left bottom jaw came unscrewed and had to get surgery to remove the plates and screws on both sides. So now im off work till i heal dont know when i will return to work. I also have to get my plates removed! When were you able to move your lips properly? Im scared becaused I couldn’t moce my lips properly after jaw surgery for a month and I heard the swelling will be the same as jaw surgery. When were you able to go to work? Hi, I’m in week 6 post op double jaw surgery for severe underbite, I feel like my upper lip is still protruding. Is it because my upper lip is still swollen? Hi! I had my surgery as a nursing major. I had mine at the beginning of a week long fall break. I took an extra a few days after that and started going to lecture. I had already emailed my professors that I wouldn’t be able to talk or even do much in class but I wanted to be there to listen and take notes. I took my first exam after about 10 days after surgery and bombed it because I couldn’t focus over the pain. This surgery distracts you from everything. However, I’d say I was able to fully participate after a month. You’ll still be sore, but able to talk and you won’t be dying of hunger or drooling on paper. Hope this helps!!! hey ! i had mine during winter break my third year as well and i was fine to go back two weeks after. tbh you’ll be fine. i was fine! if anything the only thing that’ll be difficult is the swelling. i had mine during winter break and I was good two-three weeks post op!!! Hi all, I’m Tonny from NYC. I got my double jaw surgery for severe underbite on Jan 23rd, 2018. I had my first follow up appointment with the doctor yesterday. Everything is going good. He showed me my x-ray photos that I took day 1 after the surgery. Anyways, there are 2 jaw wing bones (I believe that’s what he called) that sticking downwards on the side along left and right lower jaw, below the ears. The doc said they will go away on their own. If not, there will be a surgery to shave those. I wonder if any of you had that after your jaw surgery? Hello all, I’m due to go in for surgery soon. I know it’s going to be rough and am dreading it. What I’m wondering is… how long until I’m able to return to work? I work in HR and talk with people all day. I don’t care if I’m swollen as I’m in my office most of the time… I just need to figure out how long it typically is before I can talk good. From what I’m reading, I’m guessing around 2 weeks. Here’s a better question— how long until YOU returned to work? That will also give me an idea. I was 55yo accountant. I took 1.5 weeks off then half time for one week. I was pretty tired after half day of work that second week and would go home and nap. For the first month i frequently closed the door and laid down for 10 to 15 minutes while at work and applied cold packs. That helped a lot. Listen to your body and don’t try to muscle through it. Had surgery jan 9 2018. also a student going back to school on the 29th . So far recovery is going well, drooling is the annoying part I will say. hey ! i literslly just had surgery dec. 20, 2017 & i was talking within 4 days. but give it like a week and a half for your speech to not sound as mumbled. I don’t work, but i am a student and i went back to school 4 weeks after my surgery, but that was because it was winter break. ok im on my 4 month now and my left bottom cheek is still swollen is that ever going to get any better i look like a damm monkey my face looks so long and my chin is still numb but i feel it coming back to live again hopefully it will get better soon they said it takes 4 to 6 months for the swelling to go away well see im being so patient i will post again when i turn 5 months in my recovery thanks. I have almost exact similar problem as you do. Im on my 5th week going on 6th. I noticed I have some foul taste coming from upper front teeth on right side where my cheek is more swollen than the left but Im assuming because the docdor placed a plate there on the right side only. Im hoping it will go away on its own because I just finished antibiotic but hasnt helped. Hi all. I am a week out from surgery and was hoping that someone could point me in the right direction. What can I eat besides protein shakes and things like ensure/boost? I am not a soup person but understand that I am going to have to deal with the to stay nourished. Does anyone have any suggestions for a menu? Try applesauce, yougart and puddings. They were my goto after surgery. I have a blender and Im eating cereals and oatmeals microwaved in bowl with milk, pasta, overcooked rice, cooked with extra water, noodles, meatloaf, macaroni, homemade smoothie, grilled cheese making sure bread is not hard or sticky but easily melts in your mouth, chicken curry with rice, the other day I bought bowl of Chipotle. Now youre wondering how Im able to eat all of these thats because after second week my bands were taken off so I have a small mouth opening and I blend everything into particles to the point of being little just before being too soupy but if soupy is ok with you then by all means. Make sure you eat like this only if you have enough opening where you can brush inside of your mouth. Write me back if you need more info. try milkshakes and smoothies !!! I am 4 1/2 weeks post double jaw replacement and upper jaw surgery. I Tull have swelling and the left side of my face and left top lip is numb as well as my top gums. My right lower lip is weak which makes my smile crooked. I can’t lift my left eyebrow or wink left eye. How long untill these things return? How long does it take to achieve maximum mouth opening after upper and lower jaw surgery? Thanks for this information. Although i am only day 4 post op i was completely un prepared for the recovery process and feel so annoyed that i feel i was not fully informed and prepared about what lay ahead for me. Right now i have huge regrets and would not recommend this to my worst enemy. Today if had airway swelling only to be made feel its my anxiety. (which i dont normally suffer from). Thank god for prednisone. Im hoping my swelling has peaked today because im not sure how much tighter the side of my check, my ear canal and throat could get. Ive only had lower jaw realignment . I cant possible imagine having had both top and bottom done. Hey Graham! Once again I return to your experience as well as the others on this amazing blog. I have left this comment before a few months ago but still have yet to see any change in my appearance. I am currently 6 months post operation (had both upper and lower jaw surgery) and my lips are still much bigger than before my surgery and it is very noticeable and to be truthful I’m kinda annoyed by them. Not only that but the right side of my face where my jaw was longer than the other side seems to be more fuller than the left and I was wondering if that will ever go down. I had my surgery at the mayo clinic in rochester but I’m kind of regretting my surgery as I think my overall appearance was much more appealing before surgery despite having s “straighter” smile now. Did anyone experience bigger lips after surgery, and is there any fix to this? Will it go down after I get my braces off? And finally will the right side of my face become less full so it’s more symmetrical to the left side, because right now I look as asymmetrical as I did before surgery because of the fullness on the right side of my face. so you had u dervite surgery right? i’m 16, bust had sarpe, upper jaw surgery, basically expanding. Was painfull and hard, the hardest for me is that i can’t eat very well 🙁 & i’m soooo curious about my underbite surgery, that’s like still 6-7 months but i’m patient. I am at 6 weeks post-op, and I am worried about my upper lip too . Right now , my upper lip seems flip upward when I talk and like catching flies when I rest . I really hope it will get better as time goes by . I noticed that some days my lips seem a bit larger than normal, but I think its because your lips are rubbing against those hooks they put on before surgery. Mine are finally going down…..
Hi. My daughter had upper jaw surgery (lefort 1), 5 weeks ago. The swelling is still there and her nostrils seem to have larger openings and whoville appearance like was mentioned. Do the nostril openings get any smaller with time? Thanks so much! Patience is definitely not one of my strong suits but I am working on it. Thanks for taking the time to respond. Good luck with your recovery. Time will heal all. I feel a bit better reading this. I am 6 months post op and very frustrated at my appearance. I feel like a monkey some days. Allie, talk to your surgeon and orthodontist. I have read that swelling can take up to 1 year before it goes down completely. .Try to continue the face/ jaw exercises – to help . Jaw surgery causes a lot of changes that facial muscles have to adjust to and u have to get use to. Good luck! Me too. I am 4 months post-op from double jaw surgery. I feel like I look like someone from “Planet of the Apes.” I’m starting to wonder if I was over-advanced. I am feeling your pain!! I had double jaw surgery 2-13-17 so I think we are on the exact same time line…. and I feel EXACTLY the way you do! Like a monster. Same thing, I look like across between planet of the apes and a skeleton . Seemed to look better after a couple of months when the initial swelling went down-in april/may-and then it got worse looking, face started looking more bizarre-sort of like Steven Tyler from Aerosmith but lips not quite that big, lol! Long skinny face, long upper lip, still a lot of numbness in my lips/gums/palate, still don’t have full mobility in my upper lip., like the muscles are stiff. My profile looks good but from the front I look odd and my mouth looks grumpy and shows bottom teeth at rest. And when I smile I look scary/evil like a predator. I used to have a beautiful smile. I had both jaws moved forward 10mm- supposedly- and I wonder if that was too much? I am hoping that the jaws will recede a bit (Dr says they usually do a little) and that whatever upper jaw swelling and around the sides/ base of my nose will continue to go down and my upper lip will shrink up and de-puff. I get my braces off in two days and I’m hoping that will help my mouth not seem so large as the braces have hooks, etc and stick out pretty far. If it doesn’t get better after braces off, I’m going to consult a plastic surgeon about fillers to balance out my facial proportions and bring back some width to mid and lower face. Also, and most importantly, I’m checking into a modified upper lip lift. There are a few plastic surgeons who do a good job with this, which is essential because of the scar location-where nose and lip meet. check out Dr Ben Talei, his scars are almost invisible plus good results and he does alot-cost is 2x as much as here in Atlanta-he’s in Beverly Hills-I think 5k, but worth it . Also there’s a guy in Boston who’s good, can’t remember name. You can look it up on Realself.com. But I hope it all just heals up and returns to normal on its own because I’ve spent enough money on braces that I didn’t need (teeth were straight) plus i had to pay 20% of my surgery because my doc was out of network. I would never go back through the surgery again, so this is my only option. On the bright side, If these issues are tweaked or hopefully improve on their own, I will look amazing-like a supermodel-plus I can actually breathe now, no more sleep apnea, and bite down on all my teeth and jaw pain has improved. I’m keeping my fingers crossed that this 6-12 month hell is going to be worth it. Let me know how you progress!!!! How are things now? I am 4 months out from double jaw surgery and I feel like a monster at times. I look like a skeleton/monkey. Face is long and skinny with a long swollen upper lip. It got better between 2-3 months and then between 3-4 months I got worse looking. I also have trouble speaking as my lips are partially numb and my upper lip has limited mobility.